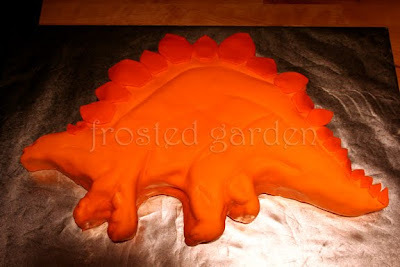 Frosted Garden: Turtle Beach, Quilted baptism, stegosaurus, girly soccer cake! Turtle Beach, Quilted baptism, stegosaurus, girly soccer cake! These cakes were made this weekend! Two tiered red velvet cake with vanilla bc and fondant. 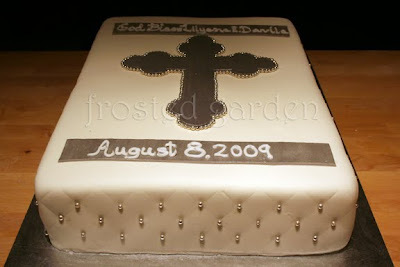 Everything is edible and made from fondant except for the little sign on the top of the cake. LOVED this cake! This cake was a bit of an experiment for us. We'd never done a cake like this, nor had I ever seen one. It's a chocolate cake (that I dyed red for effect) with chocolate icing and fondant. I like the way it came out but we definitely feel like there could be improvements. 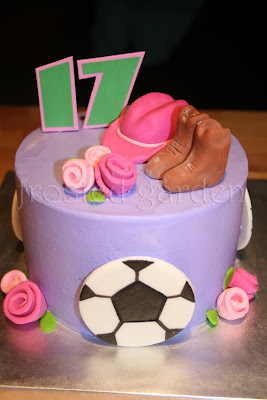 The request for this cake was soccer, Texas themed and girly. 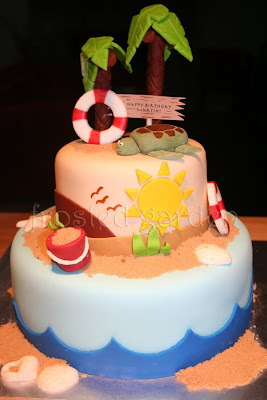 I'd seen a cake similar to this with more of a music theme and I used it as my basis. Everything on the cake is edible, except for the "17." I made the numbers out of fun foam. I really like the way this cake turned out, hopefully the birthday girl liked it too! Wow, I love your turtle beach cake - sooo cute! The birthday girl LOVED her cake!! You did such a great job! Thank you thank you!! Monika, thanks so much! It was a lot of fun to work on.